Just like the NBA, the list of the best selling NHL jerseys for 2013-14 has a familiar name at the top. 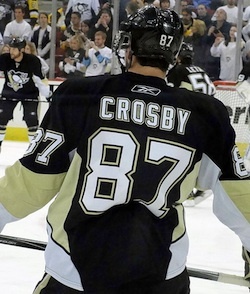 Sidney Crosby leads the way, with another typical name at 4th in Alexander Ovechkin. Two Chicago Blackhawks, Jonathan Toews and Patrick Kane, are also in the first five, and Pavel Datsyuk at second completes the top grouping. The list from the NHL reflects the best selling jersey from the 2013-14 NHL regular season. While the list includes a good mix of talent, there are definitely some surprises. Ryan Callahan might seem unlikely at number six, but it is important to note that since he was traded from the Rangers to the Lightning, a whole new jersey market opened for him mid-season. The same situation likely helped Ryan Miller's numbers as well. Fans and collectors might also be surprised by Steven Stamkos at number 16, which seems low for the elite scorer. T.J. Oshie, who enjoyed a breakout performance in the 2014 Winter Olympics, saw a considerable bump in interest, which translated into a top 20 spot for the year. Understandably, several big market teams received the most interest, with Pittsburgh, Detroit and the New York Rangers each having three players on the list. Over half the league was not included in the list, with 16 teams not contributing a player to the top 25. The totals were based on overall sales data from shop.NHL.com during the 2013-14 regular season. Click the listings below to shop for specific jerseys on eBay. * Denotes players who changed teams during the season.